The mobile phone has been in the African continent for slightly more than a decade now. However, though the gadget has been used for services such as mobile money and internet access for a long time, it is only now beginning to be used in the education sector. New startup sterio.me, which launched in Lesotho and is gradually spreading outwards, is providing teachers with a platform through which they can reach their students at home. Accessed via SMS and voice on basic phones this provides free recorded materials to help facilitate better education. We catch up with Christopher Pruijsen, the founder and CEO, to discover how this is taking this continent and the education sector by storm. Can you tell us about the basics of your company, what is the size of sterio.me in terms of employees? We are three founders and have one fulltime engineer, as well as three part-time staff. In addition to this, we are hiring more staff as the startup is growing day-by-day. How do you package your product/service to suit both teachers and students? We work with teachers, who then tell their students to do their homework via their mobile phones when they are at home. [This works] simply by (students) sending an SMS to our number which triggers the free lessons via inbound voice calls and/or SMS. When did you start and where in Africa? Has the idea of an African reach been with you for long and nurtured through time? We started on StartupBus Africa 2013 (now http://ampion.org) which I co-organized. The idea of education via mobile phones, especially basic phones, has been with us for a long time. I had visited South Africa and Nigeria before on business and was already keen to get more involved in entrepreneurship on the continent (hence I co-founded StartupBus Africa/AMPION as well). What is StartupBus Africa and how is it relevant to Sterio.me? It is the hackathon on a bus that went from Harare (Zimbabwe) to Cape Town (South Africa) in November 2013, and during which we conceived what is now Sterio.me. What is the technology behind your operations? How does this technology ensure that there is smooth flow of your operations? We have a technology mainly based on telephony on the back-end (interactive voice response, SMS) and by integrating state-of-the-art technologies such as text to speech, automated speech recognition and text matching. Some of these we are still working to integrate. With improving internet access in Africa, do you see your operations assuming this angle, a web-based app maybe? Although internet access is improving, the majority of people (60% of the global population) still do not have access to the internet, and more than 60% of all phones in Africa are basic phones without internet access. Although feature and smartphones are becoming increasingly relevant, we don't see the basic phone disappearing any time soon and expect this to continue to be relevant for at least a decade. Plus, a move to 2G feature phone offerings is quite easily implementable. We are to my knowledge the only company taking both a teacher-first approach and utilizing the power of pre-recorded interactive voice as opposed to internet-reliant or text-only methods of interactive learning. Can this innovation be applied to other sectors like mobile and/or eCommerce? If yes are you considering it? One hundred percent. We are actually shifting our revenue model towards white label sales of our technology. Any organization wanting to implement interactive pre-recorded voice and SMS for learning, polling, training or information service should get in touch. Who are your competitors in Africa and what makes you better/worse than them? What technology are they using that you do not have access to, if any? I wouldn't call the other companies in the educational technology space competitors per se. There are several companies in the space doing amazing work; take Eneza Education for one in Kenya. I really admire what this company has been able to accomplish. We take a slightly different approach, utilizing interactive voice lessons for example in addition to SMS content, and our revenue model will largely be based on white labeling our platform as opposed to school subscriptions (in the short-mid run) but definitely consider me cheering on the sidelines and learning from their approach in shaping ours. Can you please comment on the education sector in Africa in general? Are there any strengths/weaknesses that you have noticed? How is your ingenuity bettering the situation? There are many problems with education in Africa. Teacher training, overcrowded classrooms, teacher attendance, school resourcing (books etc. ), the home situation and distance to school for many students etc. etc. What we aim to do is save the teachers time and effort on the homework process, and enable the learner to do short quizzes to reinforce content each and every day. We also offer teachers rich data on student performance so they can give individual guidance and improve curriculum, and we offer districts and ministries of education real-time data on student and school performance, enabling them to stage more timely interventions. Are the African governments’ education policies conducive to your operations? Yes, so far Ministries of Education have been very positive. Our business is heavily reliant on partnerships and integrations with telecom providers. However, since we refined our pitch these conversations have become easier and easier. At the moment Vodacom Foundation Lesotho is already in partnership with us sponsoring our airtime and we are in talks at a C-level with one of the largest telecom providers on the African continent. Would you say that Africans are good at embracing technology? Is this reflected in your operations? Yes, Africans are faster to embrace new technology (mobile phones, mPesa etc.) than any other nation on earth. It took more than a century for telecommunications to really kick off in Europe. What are the five African markets do you feel are most important in your operations and why? Which one do you feel you cannot do without? Lesotho - our first market where we have a close relationship with the Vodacom Foundation. Other promising markets for us are Ghana, Tanzania and many others. Of course at some point we'd like to launch properly in Nigeria - the biggest African economy - if you can make it there you can make it anywhere. I think there is a big need for improvements in teacher training, and that technology can play a large part in this. Tablet solutions whilst interesting for students, can make a more cost-effective and scalable impact here in my opinion. What is your greatest achievement so far? Are there any statistics? How many countries do you have under your sleeves? Which is next in line? Our greatest achievement is the integration with Vodacom Lesotho and our continued work in the market. More recent developments cannot yet be disclosed. With the vibrant and thriving social media picture, how do you ensure that the use of mobile phones by this young group does not end up “social” but educational? Our application is teacher-student driven, and making use of pre-recorded/pre-programmed lessons. I don't see how this question is relevant to our platform. Any advice to the African telecommunication giants and decision makers? What do you feel they are missing or messing? More value would be retained in the economy, and more growth would result, from opening up this market. What are your shorter and long-term goals? 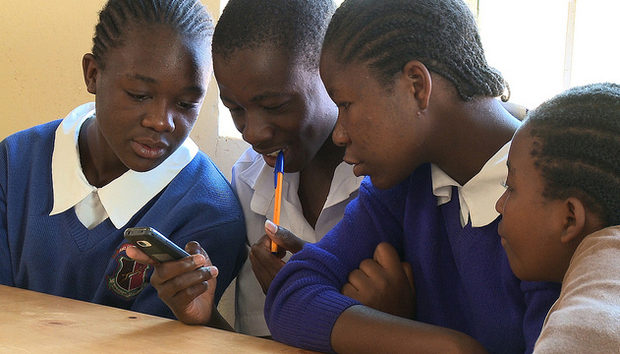 Are there plans to use more tech-based apps to improve access to educational materials? We plan to expand our (service) offering not via "apps" but via GSM-only solutions first and foremost, and in a later stage via 2G compatible compressed text file offerings which would be less interactive but longer form (for example a book chapter).